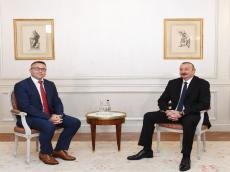 President of Azerbaijan Ilham Aliyev has met with president of Iveco France, Head of Iveco Global Bus Sylvain Blaise in Paris. President Ilham Aliyev noted with satisfaction that the environmentally friendly buses of IVECO France successfully operate in Baku. He especially emphasized the role of these buses in the development of Baku transport infrastructure. Ilham Aliyev said that thanks to IVECO buses, many problems related to public transport in Baku found their solution. Sylvain Blaise stressed that Baku is the leading city of the region in the field of transport infrastructure. He noted that the bus depot in Baku is organized in accordance with international standards. He expressed hope that the company’s buses play a leading role in modernizing the infrastructure of public transport, and the company’s other equipment - in the agricultural sector.